Upgrade to Windows 8 for just $14.99 (or INR 699) - Free Promo Code trick! 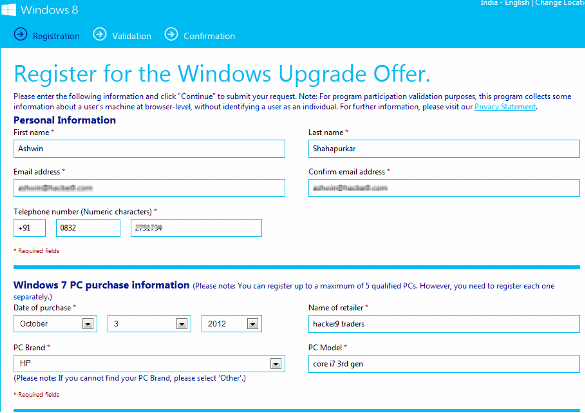 Upgrade to Windows 8 for just $14.99 (or INR 699) – Free Promo Code! After successfully distributing Windows 8 beta versions and studying user feedback, Microsoft has finally released its much awaited copy of OS “Windows 8“. This Microsoft’s new operating system is completely different from all previous versions of Windows. If you thought Windows 8 is only for touch devices, Let me tell you Windows 8 is brilliant on a regular desktop as well. The New OS has Fantastic User Interface and is Much faster than predecessors. Before i tell you how you can upgrade your PC to Windows 8 for just $14.99, Let me first tell you the actual Price of this new OS. The MRP of Windows 8 Pro version is $169.99. But for a limited period of time(till Jan 31st 2013), Microsoft is offering a big $130 discount to encourage early adaption of the latest Windows OS. 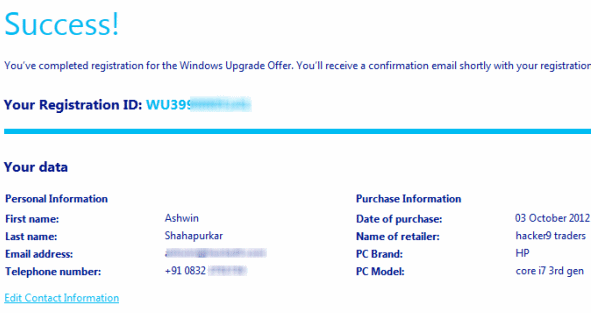 That means the existing Windows 7/Vista/XP users can upgrade to Windows 8 for just $39.99 (or INR 1999). Where to get promo code? 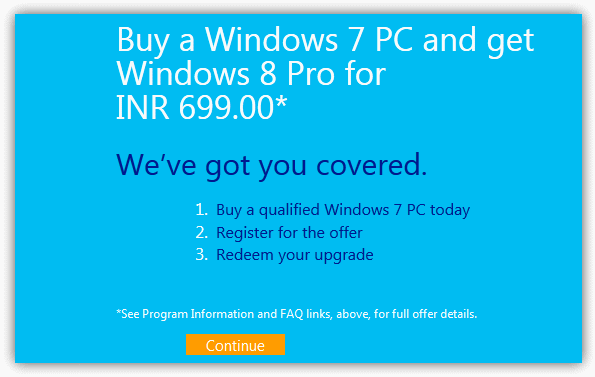 In addition to above mentioned offer, Microsoft is running another promotional offer for users who have bought a Windows 7 PC between June 2, 2012 and January 31, 2013. That means if you have bought your Windows 7 system after 2/6/2012, you are eligible for a further discount and can actually upgrade for just $14.99 or Rs.699. Interestingly due to some loophole, This offer can be claimed by anyone by just providing fake details!. Even if you are using pirated version of Windows 7/xp/vista, you can take advantage of this offer without any problem. Once you are on offer page, select your language from the list of country specific languages. Once you select your country you will see the offer page. Just click continue. Once you fill out the form click continue to validate your details. Once Microsoft validates your fake information, you will see the below page with all your details. Now once you get this success!! message, You will soon receive an email that includes your personal promotion code which enables you to receive the special promotional pricing for the download of Windows 8 Pro. Alternatively, You can also get your Promo Code by logging into My Order! -> Enter your Registration ID, Email Address and the Security Check characters to log in!